There was a chill blowing in the air this morning, and both kids were wheezy, Mr 9, sick enough to stay home in bed. In Brisbane that can only mean one thing: It's Ekka Time! Much-loved (and at times loathed) by Queenslanders, Brisbane's annual Ekka is synonomous with the three F's. I'm talking Fun, Food and Flu. The Ekka is known as the time when the country comes to the city. Indeed, the annual visit to the Royal Brisbane Show was a highlight of my childhood. Each year, my parents made the trek from Wondai, four kids in tow, one of them - me - being sick in the car on the way there, and the way home. We'd set up base at Uncle Clarrie's spot in the dairy cow pavilion, so there was always a respite from the crowds and a reviving cup of tea if we needed one. Mum saved money by packing sandwiches and drinks, but my parents always shelled out for a strawberry ice-cream and dagwood dog each. We also got to choose two sample bags each, and two side show alley rides or attractions. If we'd saved our pocket money, we could splurge on a few extras too. As an adult I still felt that frission of excitement when I drove past the showgrounds yesterday and clocked the Ferris Wheel rising majestically above Sideshow Alley. Pretty much every year we go, spend a load of money, fill up on junk food, and come home weighed under by showbags full of sweets and crappy toys. And we love every minute. At the Auckland Show, there were no showbags. Gasp! Unbelievable, but true. The kids were disappointed, but I was secretly pleased (and much wealthier as a result!). There were no Dagwood Dogs or Pluto Pups. They did have 'Hot Dogs', battered meat sausages on a stick (not a battered frankfurt). American Hot Dogs were frankfurts in buns. The carnies were really friendly and chatty, especially with the kids, and making our way through it was a breeze. One carnie gave Harmonie several extra goes to allow her to get a prize. And it was not Sideshow Alley. It was The Carnival Area. There were no strawberry ice-creams. In fact, I don't think there was any iconic show food like there is at the Ekka. Not even a fruit salad inside half a pineapple or a cream horn. There were wine and art categories, and ubiquitous animal exhibitions, but no cake icing competitions, baking, flowers, or fruit and vege competitions. Yes, I know, it doesn't bear thinking about really, does it? Overall, the show was much smaller than we were used to, but that also meant fewer crowds and less kiddie meltdowns. The main similarity? The expense. It cost us $30 just to get through the gates, and I shudder to think how much we spent on food, drink, rides and games. It was a fun day out, and I'm glad we checked it out. It was no Ekka though. 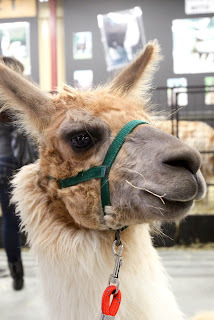 Because there is nowhere quite like the Brisbane Ekka! This llama is going to the Ekka. Are you? Haha Ekka sounds like so much fun! Gotta love those iconic carnival foods :D When else can you see deep fried cheesecake or dagwood dogs? Sorry the Ekka is far to dear If our daughter wants to go she can go with a group of her friends when she is a teenager. Oh, I LOVE the Ekka! My childhood experience of it sounds exactly like yours, right down to the dairy pavilion. Maybe we bumped into each other? There's nothing much better than sitting at the ring with a dagwood dog and a Samboy Chips showbag! Ηi thеrе! I knοw thіs iѕ kinԁa οff topic but I'd figured I'd аsκ. in trading links or maybe guest аuthoring a blog artіcle οr ѵice-versa? subjeсts as youгѕ and I believe we coulԁ greatly benefit from each other. If you might bе interested feel free to shοot me an email. I loοκ forwaгԁ to heаring fгom yοu! Εxcеllent blog by the ωаy!